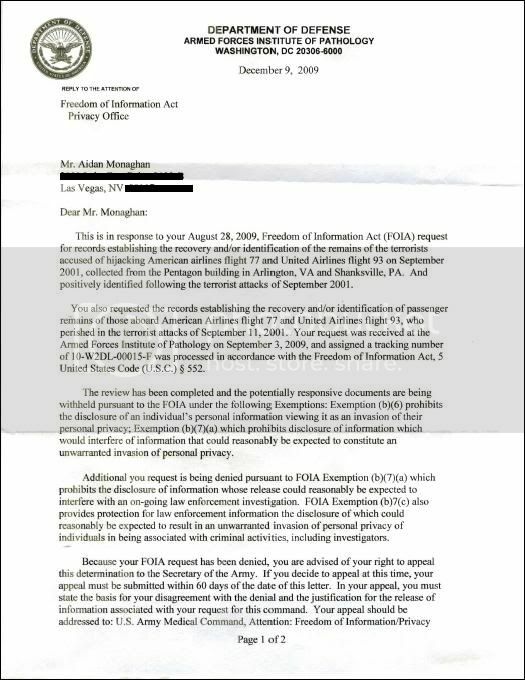 The following is a Freedom of Information Act (FOIA) reply from the U.S.Armed Forces Institute of Pathology regarding a request for records that confirm the collection and identification of terrorists accused of hijacking American Airlines flight 77 and United Airlines flight 93 on September 11, 2001. Such records are reportedly exempt from disclosure under exemption (b)(7)(a) which prohibits disclosure of information which would interfere with an on-going law enforcement investigation and exemption (b)7(c), which also provides protection for law enforcement information the disclosure of which could reasonably be expected to result in an unwarranted invasion of personal privacy of individuals in being associated with criminal activities, including investigators. This is in response to your August 28,2009, Freedom of Information Act (FOIA) request for records establishing the recovery and/or identification of the remains of the terrorists accused of hijacking American airlines flight 77 and United Airlines flight 93 on September 2001, collected from the Pentagon building in Arlington, VA and Shanksville, PA. And positively identified following the terrorist attacks of September 2001. You also requested the records establishing the recovery and/or identification of passenger remains of those aboard American Airlines flight 77 and United Airlines flight 93, who perished in the terrorist attacks of September 11,2001. Your request was received at the Armed Forces Institute of Pathology on September 3, 2009, and assigned a tracking number of 1O-W2DL-000I5-F was processed in accordance with the Freedom of lnformation Act, 5 United States Code (U.S.C.) § 552. The review has been completed and the potentially responsive documents are being withheld pursuant to the FOIA under the following Exemptions: Exemption (b)(6) prohibits the disclosure of an individual's personal information viewing it as an invasion of their personal privacy; Exemption (b)(7)(a) which prohibits disclosure of information which would interfere of information that could reasonably be expected to constitute an unwarranted invasion of personal privacy. Additional you request is being denied pursuant to FOIA Exemption (b)(7)(a) which prohibits the disclosure of information whose release could reasonably be expected to interfere with an on-going law enforcement investigation. FOlA Exemption (b)7(c) also provides protection for law enforcement information the disclosure of which could reasonably be expected to result in an unwarranted invasion of personal privacy of individuals in being associated with criminal activities, including investigators. Because your FOIA request has been denied, you are advised of your right to appeal this determination to the Secretary of the Army. If you decide to appeal at this time, your appeal must be submitted within 60 days of the date of this letter. In your appeal, you must state the basis for your disagreement with the denial and the justification for the release of information associated with your request for this command. 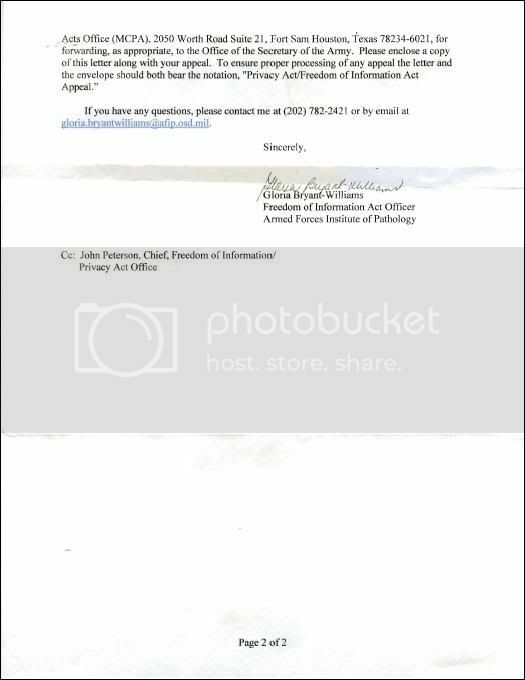 Your appeal should be addressed to: U.S. Army Medical Command, Attention: Freedom of lnformation Privacy Acts Office (MCPA), 2050 Worth Road Suite 21, Fort Sam Houston, Texas 78234-6021, for forwarding, as appropriate, to the Office of the Secretary of the Army. Please enclose a copy of this letter along with your appeal. To ensure proper processing of any appeal the letter and the envelope should both bear the notation, "Privacy Act/Freedom of Information Act Appeal." The DNA identification in this case (an perhaps others) is potentially very troubling. There is no demonstration of use of controls and separating samples which made up the database from the sames provided by relatives for matching purposes. This leads to the possibility of the coroner simply declaring that a match exists or creating one by co mingling DNA from matching samples with recovered remains. I am not aware of any controls in place for handling and segregating the recovered material from the matching material. Perhaps another reader can provide links to the handling and chain of custody of the material. The proper way would be for would require that the sample DNA is matched to what was recovered by a independent lab which receives the both sets of DNA fingerprints and compares them for matches - NOT THE ACTUAL DNA MATERIAL which should be segregated and locked up after it was scanned. I am curious if anyone knows is this process or something similar was employed. Absent the double blind process, the results are essentially meaningless. For sure many individuals can be identified from the DNA recovered. But it is obvious that identifications can be asserted which were simply created from samples provided for matching IF SOMEONE FELT THIS WAS IMPORTANT. Chain of custody is key here. Sandero on Mon, 12/21/2009 - 11:17am. Privacy for the dead? Ongoing investigation? A person's FBI records can be released under FOIA upon their death, barring other exemptions- such as this canard about an "ongoing investigation". Bizarre they're claiming "privacy"
loose nuke on Mon, 12/21/2009 - 11:56am. DNA identification (for each alleged hijacker) requires a pair of samples, one sample from the deceased (in situ) and another sample from the deceased prior to death, or from a relative, in order to make a match. To achieve this, investigators (FBI?) would have somehow successfully obtained body material specifically from each of the 19 alleged hijackers, as well as already having body material from at least one relative of each and every one of the 19 alleged hijackers in their possession .... stored in some refrigerated facility to prevent degradation and decay?.... in order to make the matches. According to the FBI, and recounted ad nauseam in media, the 19 alleged hijackers were "positively identified" very shortly after the attacks, according to the FBI. If the FBI was telling the truth about "positively identifying the 19 hijackers", then how (and why) did the FBI have (DNA) samples from either the alleged hijackers and/or their relatives in their possession ready to use to make matches? Since the 19 were "positively identified" within days, then it is more than likely that the FBI (or other agency) was already in possession of the required DNA from a time before the attacks took place (?!!). How many of the alleged hijackers had relatives living in the US who were quickly contacted by the FBI for the purpose of obtaining DNA samples, before they know who they were looking for? Furthermore, how did they obtain specific samples from the *alleged* 19 from the wreckage at Ground Zero, the Pentagon and Shanksville so quickly after the attacks, when even 8+ years afterwards, hundreds of *KNOWN*victims have still not yet been positively identified via DNA matches? If I am missing something here, or I am in error re. DNA matching, someone please cast some light! bloggulator on Mon, 12/21/2009 - 2:32pm. The DNA identification of the hijackers was completely fabricated obviously is this was how they were positively identified. That is the only possible conclusion. Sandero on Mon, 12/21/2009 - 3:15pm. whether positive identification is referring to DNA id or other means. Of course it is extremely doubtful, to say the least, that they could make positive IDs in a few days from anyone on an aircraft that went into the world trade center towers. pduveen on Mon, 12/21/2009 - 10:30pm. The passenger list for Flight 77 released by American and reported by CNN did not contain any Arab names, presumably because this was a Victims' list and didn't count the 'terrorists' as victims. However this list did not contain 3 additional passenger names either: 1) Robert Ploger, 2) Zandra Ploger, and 3) Sandra Teague. Did they board without tickets? Yet these 3 did show up in the autopsy results and were subsequently listed as passengers by the FBI along with the 5 patsies. (Still No Arabs names for the autopsy results-- or unidentified bodies presumed to be them). I don't know too much about this aspect, just what I read in a globalresearch report by the Naval pathologist who filed the FOIA. It's also bewildering how a plane that's so obliterated so as to not have identifiable engines is able to preserve bodies for autopsies! Of course I still don't see how you level off a plane that's making a 330-degree descending turn to come in "LOW AND LEVEL." It defies the laws of physics. RL McGee on Mon, 12/21/2009 - 4:24pm. marzi on Mon, 12/21/2009 - 4:56pm. I've seen a photo of a burnt quite intact corpse in the pentagon. Don't know how it got there, or who it was identified as. Sandero on Mon, 12/21/2009 - 5:33pm. Joe on Mon, 12/21/2009 - 6:58pm. RL McGee on Mon, 12/21/2009 - 7:27pm. What's the update on this lawsuit? Denying April her benefits seems to have been a mistake - she's made the best case against the conspirators and it's been blasted over the internet. This site has not given her much space which is unfortunate, and Robin was one of her advisors in her lawsuit. marzi on Tue, 12/22/2009 - 8:47am.